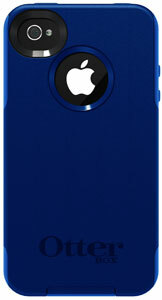 This sleek and tough case protects from scratches, bumps and shocks. The new camera rivals point-and-shoot cameras on the market and deserves the level of protection only OtterBox delivers. With two layers of protection that work together to divert any impact force away from the device, your new iPhone is ready for anything. Ports are accessible and protected from dust and debris (view larger). This is the case you need if you want protection with style. Slim and sleek, this case provides substantial protection that keeps you and your device looking great while you stay on top of your highly connected life. Design begins with the device. Thorough evaluation of the iPhone and its functions are taken into account as we develop and refine. From initial concept designs to final product drawings, every aspect of the iPhone is given careful consideration to ensure we create the most usable and protective solution possible. Engineered design is inspired by the iPhone – ergonomics feel good and accommodate natural use Aesthetics – textures and styling in combination with high quality materials create an attractive protective solution Sleek – slim form factor fits in pockets Durable silicone absorbs impacts from bumps and shock (view larger). All features are fully functional through the case (view larger). Precision design ensures all features and functions are accessible with the case on. Ensures ideal usability and portability; additional features integrated to enhance the user experience.